Swift Current Mennonite Brethren Church, ca. 1950-1951. 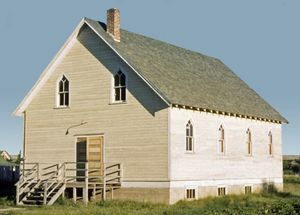 For reasons of lack of suitable transportation to surrounding churches and growing numbers of Mennonite Brethren in the Swift Current area a group met on 23 November 1933 to discuss the feasibility of a new church and unanimously decided to start a new church. Twenty-six charter members officially founded the Swift Current Mennonite Brethren Church on 21 June 1934. The Depression prevented the construction of a church building until 1940. Until then the members met in private houses. The first building, which seated 100, was supplanted in 1959 by a 250 seat building on 15th Ave and Winnie St. In 1977 they dedicated a new 600 seat sanctuary and the name was changed to Bridgeway Community Church. The three leaders elected in 1934 were Gerhard A. Warkentin (moderator), Isaac K. Epp (assistant), and Frank J. Peters (secretary and treasurer). While all three were also called to be lay ministers, Peters was the foremost of the three. He officiated at the first baptism on 26 July 1936. 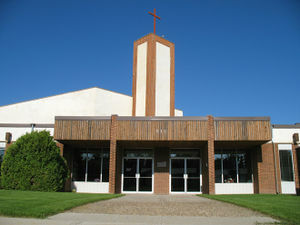 Brad Wall, the Premier of Saskatchewan (2007- ), was a member of this congregation. Canadian Mennonite (26 May 1959): 1. Mennonite Brethren Herald (27 May 1988): 64. Mennonite Observer (11 December 1959): 3. Toews, John A. A History of the Mennonite Brethren Church: Pilgrims and Pioneers. 1975: 164. Available in full electronic text at: https://archive.org/details/AHistoryOfTheMennoniteBrethrenChurch. Epp, Marlene and Sam Steiner. "Bridgeway Community Church (Swift Current, Saskatchewan, Canada)." Global Anabaptist Mennonite Encyclopedia Online. October 2017. Web. 19 Apr 2019. http://gameo.org/index.php?title=Bridgeway_Community_Church_(Swift_Current,_Saskatchewan,_Canada)&oldid=163603. Epp, Marlene and Sam Steiner. (October 2017). Bridgeway Community Church (Swift Current, Saskatchewan, Canada). Global Anabaptist Mennonite Encyclopedia Online. Retrieved 19 April 2019, from http://gameo.org/index.php?title=Bridgeway_Community_Church_(Swift_Current,_Saskatchewan,_Canada)&oldid=163603. This page was last modified on 11 March 2019, at 02:00.